A unique ecotype of the woodland caribou subspecies (rangifer tarandus caribou), mountain caribou reside in limited numbers in interior British Columbia, western Alberta, northern Idaho and northeast Washington. Historically, they were also present in northwestern Montana and central Idaho. The South Selkirk Mountains herd of mountain caribou, the world’s southernmost remaining caribou and the only herd that still ranges into the lower 48 states, occupies a transboundary range from southeast British Columbia into northeast Washington and northwest Idaho. 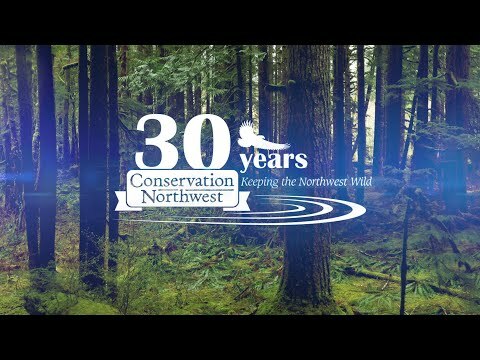 Conservation Northwest is a leading organization in the fight to save the critically endangered caribou of the Inland Northwest. Learn about the collaborative Mountain Caribou Project, an effort we’ve long been involved in with Wildsight and other partners. We’re also supporting a new effort, the Mountain Caribou Initiative, to raise awareness about these important creatures. April 2018: Read our joint letter requesting an immediate moratorium on destruction of caribou habitat in B.C. We’re proud to be a sponsor of this new documentary film from the Mountain Caribou Initiative. Last Stand: The Vanishing Caribou Rainforest is a cinematic journey into the tragically threatened world of endangered mountain caribou, their home in the world’s largest remaining inland temperate rainforest, and the critical human choices that will ultimately decide the fate of this stunning ecosystem. In 2018, as few as three mountain caribou remain in the South Selkirk Mountains herd, the only caribou that roams into northeast Washington and northwest Idaho. A map of British Columbia’s caribou populations. The unique southern mountain caribou herds are shown in purple in the lower right. Map: Wildsight. Larger version available here. These Northwest natives are greatly isolated by major highways and human development, and have steadily declined from an estimated 47 animals in 2007. Caribou are tough enough to thrive in the planet’s harshest environments; but not tough enough to survive the fragmentation of the old-growth forests on which they depend for food and security. Triage strategies may be necessary but only forestall the inevitable without addressing the root causes of caribou declines. Red-listed in Canada and protected in the U.S. as an endangered species, mountain caribou are vulnerable and few in number. However, at the request of snowmobile groups, a downlisting of the Selkirks caribou to “Threatened” status has been proposed by the U.S. Fish and Wildlife Service. At the request of the Idaho State Snowmobile Association and other groups, the agency is arguing that these caribou are connected to a larger population in Canada and don’t require the Endangered listing. This is completely contrary to a considerable body of science generated over the past three decades! This risky move is being actively opposed by Conservation Northwest and many other conservation groups. As part of the Mountain Caribou Project, Conservation Northwest works closely with Wildsight and other conservation groups in Canada to protect mountain caribou and their unique forested habitat. Our staffers in Washington and British Columbia support recovery planning and habitat conservation. We also actively communicate about mountain caribou and issues related to their recovery to ensure the public stays informed about these critically endangered Northwest natives. Protection from snowmobiles in the Selkirks and an important new recovery plan agreement between the Canadian government and conservation groups for herds north of the border promise hope for a future for these animals. Because of their seclusion and alarmingly low numbers in the U.S., we believe it’s critical that mountain caribou (technically a woodland caribou ecotype) retain an Endangered listing under the ESA. The South Selkirk Mountains woodland caribou are unique because of their feeding habits and habitat use patterns, and they’re the lone wild caribou we’ve got in the United States outside of Alaska. Mountain caribou are considered one of the most endangered large mammals in North America. Loss of old-growth habitat to logging and other development have removed old growth and reduced caribou numbers to roughly 1,900 animals across North America. In British Columbia, logging, road building, and motorized recreation are still caribou’s chief threats. Caribou rely in winter on arboreal lichens which develop only in old-growth forests. The continuing proliferation of motorized recreation in winter such as snowmobiling stresses caribou during a season when their health is weakest. This can force caribou are into poorer habitat, where predation and avalanche risks are higher and nutrition sources marginal. Though their appearance is similar, the woodland caribou (Rangifer tarandus caribou) of central Canada and the northwestern United States differ from the the other caribou subspecies of Alaska, northern Canada and northern Europe and Asia. Woodland caribou in British Columbia, western Alberta, northeastern Washington, and northern Idaho are a unique ecotype of caribou distinguished from other woodland caribou by their winter diet consisting almost exclusively of arboreal lichens. This trait allows them to inhabit the deep snow areas in the Selkirk Mountains above 4,000 ft, and these caribou are often referred to as “mountain caribou” or “deep snow caribou”. The more northerly caribou include three subspecies in North America; the Porcupine caribou (R. t. granti), the barren-ground caribou (R. t. groenlandicus), and the Peary caribou (R. t. pearyi). Woodland caribou do not make the great migrations common among some of these other caribou subspecies, nor do they live in such great numbers, even during historical times. Caribou in Europe and Asia are also called reindeer, and numerous subspecies exist there from Norway to Mongolia and Siberia. While barren-ground caribou migrate long distances seasonally, woodland caribou live within the same mountains and forests. To find food and escape predators, they climb high into the mountains in summer and descend into old growth forests during the chilly winter months. Amazingly, in winter woodland caribou depend absolutely upon arboreal, or tree, lichens as their main source of food. Barren-ground caribou eat lichens that grow on the open ground. Huge hooves keep woodland caribou “afloat” over deep snowpacks, giving them the “step-up” to browse tree lichens growing from the lowest branches of old-growth trees. Tree lichens thrive in the moist, internal air within the forest canopies of the Inland Temperate Rainforest.